Many of us have been frightened away from anything remotely fatty by the fear of heart disease, but cutting back too far can lead to a whole host of health problems, including, yes, heart disease! 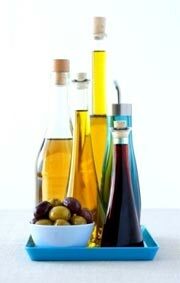 Just as important in our diets as protein, carbohydrates, vitamins and minerals are fats and oils. Oils are easily misunderstood! Nutrients in fats and oils, called essential fatty acids, are needed by every cell in the body and play a vital role in maintaining our health. But don’t choose any old oil. The right kind can help keep our hearts pumping, our joints supple and can improve the texture of our skin. The wrong kind could do more harm than good. But how do you know which is which? Most of the oils and margarine we see on the shelves are mass produced, even though the labels make attractive claims such as ‘low in cholesterol’ or ‘high in polyunsaturates’, many are processed with solvents and subjected to high temperatures which destroy certain nutrients. The key when it comes to quality is ‘cold pressing’. This means that the oil has been extracted by natural method which doesn’t damage essential fatty acids. Quality oils use the words ‘cold pressed’, ‘unfiltered’ or ‘extra virgin’ on the label. Make sure fats and spreads have the words non-hydrogenated on them. If they are organic too, then so much the better. Research shows that people who eat olive oil every day tend to have far better health than those who don’t. This oil is believed to be good for balancing cholesterol and blood pressure levels, and for keeping blood glucose on an even keel. It aids digestion and, internally and externally, is a great remedy for aching joints, dry skin, dull hair, dandruff and weak nails. Nearly all supermarkets stock a good range of ‘extra virgin’ oil, recognizable by its glorious green to gold color. Most brands are Italian but Spanish and Greek olive oils are excellent too. If the label just says olive oil or uses the word ‘pure’, this probably won’t be the best, in fact the Italians use this kind of ‘pure’ oil to light lamps! Health stores and delicatessens are more likely to sell organic or unfiltered extra virgin olive oil which is expensive but better for you and tastes wonderful, especially in salad dressings. A good tip is to buy oil in cans or dark bottles. If not, go for clear glass, but avoid plastic bottles. New margarine that include olive oil in their ingredients may have some of the health benefits but there’s nothing like the real stuff, so go for the oil. Olive oil is great health booster but if you want all the benefits of this diet remember that fresh is the best, eat five helpings of vegetables, salads and fruit every day. Use garlic, onions and chives to liven up meals, they’re full of allicin which fight infections. Tomato rich diets can reduce the risk of heart disease by 50%, peppers have more vitamin C than oranges, and herbs have a multitude of health benefits. It’s not just your health you’ll help improve but the flavor of your foods. Cook or dress as many as you can with olive oil. Sesame oil is high in lecithin which makes it good for depression and anxiety. Use in mayonnaise, pasta sauces and stir fries. Walnut oil is rich in the same essential fatty acids as oily fish and is good source of Vitamin E. Use with lemon juice to dress salads, or in vegetarian dishes. Pumpkin or squash seed oils help the heart and circulation, and are good for the digestion. Sprinkle on cooked vegetables and pasta dishes. To make healthier chips, scrub organic potatoes and slice, leaving the skins on. Rinse well and dry. Heat 4 tbsp olive oil and fry for 15 minutes, until just brown, turning them once. Sprinkle with sea salt and pumpkin seeds for extra nourishment. Keep some home made Mediterranean vinaigrette in the fridge to dress salads. Blend 2 tomatoes (skinned and deseeded), 2 garlic cloves, 4 chopped shallots, 2 tbsp fresh basil, 180 ml olive oil, 60 ml red wine vinegar and seasoning in a blender or food processor. Roast your veg in 2 tbsp olive oil per 700 g potatoes (peeled and cut into chucks). Sprinkle with chopped thyme or rosemary, spoon over 1 tbsp honey and cook at 190°C/375°F for about 1 hour for a caramelized taste. Very informative post! Now, i know what oil to use because of this post and how to store them properly..Hi, interested to have a link exchange with me? Please email or leave a comment at my blog..thanks! Thanks for this reminder! Our Mediterranean friends living in the other side of the Atlantic, have been eating healthy fats and oils in smaller food portions, indulging periodically, and savoring the taste of their food for generations. They generally weigh less and suffer from less heart disease. We would do well to give serious consideration to eating the ”European Way’! Really informative!This is why I have been telling my mom to say no to fatty and oily foods.At 52, she must be health conscious as to avoid heart problems and the likes.